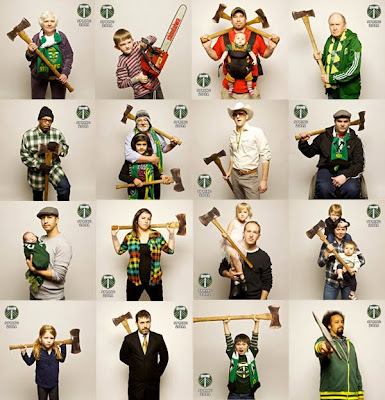 As part of the Timbers campaign, we photographed a couple of thousand Timbers fans holding axes and chainsaws and striking NO PITY poses. They came out nice. We gave them to people to use as their profile photos online and we also used some in advertising. 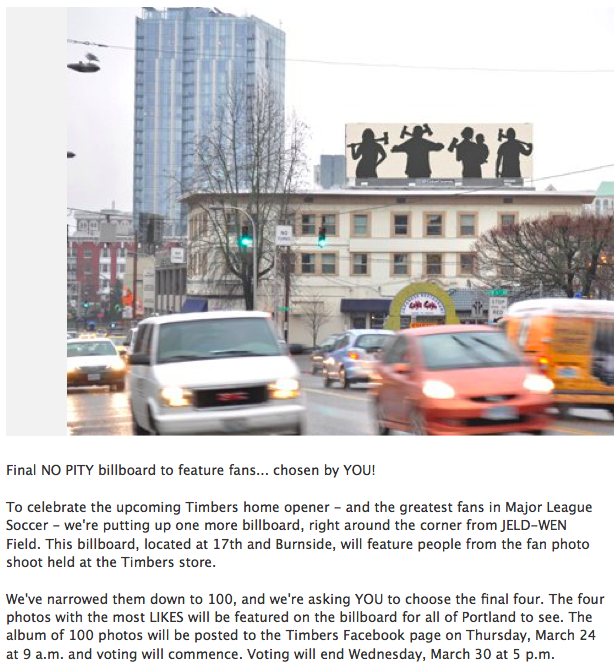 Last week we announced that we're creating a billboard with four of the fan photos and letting the fans vote on them. As of today, here are the sixteen finalists. Individually four great shots, but combined they make sort of an odd story. If I had my druthers, I’d create my own composition, taking into consideration the photos that people like the best, but combining them to create a narrative that tells a broader story that lots of people could see themselves in. Since parent-with-small-kids are over-represented, I’d choose just one to represent that group: the dad and ballerina. It might not be my favorite of the three family shots, but it’s clearly the crowd’s top pick, so I’d go with that. If you take the other top favorites, they combine nicely to make a good story. This would be a great billboard. I’m going to post it on the Timbers Facebook page and see what sort of reaction it gets. If it ends up the other way, I can live with it, but it won’t be as good. That’s my point of view, at least. I so agree with you on the over-representation of certain groups. I loved the grandma! I'm a grandma! 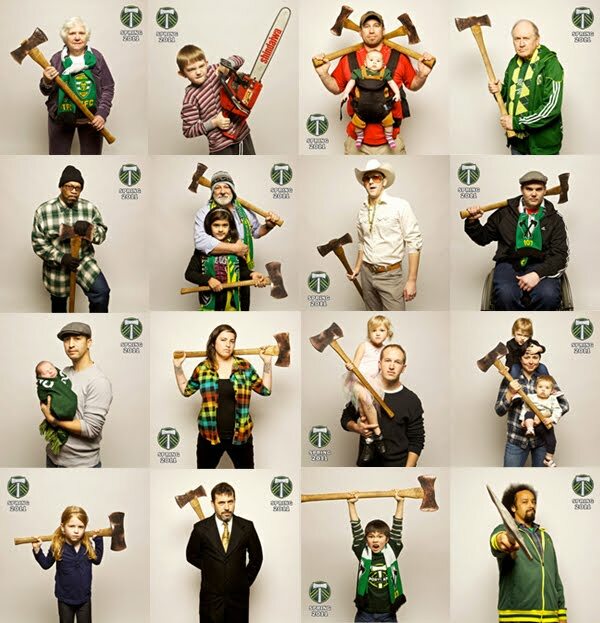 I love the Timbers too! It leaves me to wonder the age bracket of those who are choosing finalists and/or how in touch they really are with the fan base. I hope they do more with the rest of the photos. There were some really great ones. I completely agree with you and really liked your banner much better as I believe it does better represent the true scope of their fan base. Personally I was hoping they would include age brackets in the selection process. When I saw the banner all I could say was,"What no Grandma or Grandpa?!" I'm a grandma, I am a fan! Given the parameters and methods used to choose the finalists (voted for on Facebook)it's no wonder it turned out the way it did. I hope they tweak their selection process in the future or this will this demographic will always be the only ones represented. I am a rare grandma I suppose...I voted for the photos on Facebook and even posted for people to also vote too. Now to figure out how to get my peers up on that billboard! To be fair, you need to give the Wisdom of the Crowd the same context you have -- the desire to compose a picture. It would have been interesting to see what would have happened if you asked people to vote by dragging and dropping their four favorite pictures into a montage or by giving people some other way to see the design challenge the same way you did. Great comment and I love the idea of letting people drag and drop the photos to build a montage themselves. Still not sure whether the top crowd result would have yielded the "best" composition? Thanks for sharing this warning on the limit of the wisdom of crowds. Had you included cats with axes, oh man, I'd vote nothing but cats with axes. BUT that wouldn't make the best billboard either.